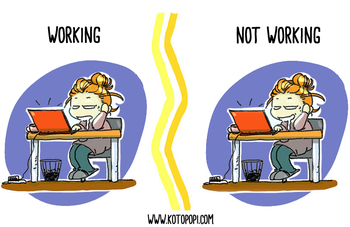 Millennials is an gag-a-day webcomic series by Kotopopi that started on Webtoon in 2016. It portrays the Millennial trope in its natural environment: a highly technologically enhanced society. The NostalgiaFilter is sometimes on, as the author herself is in between generations. When the gag is about something she identifies with, she shows up in her avatar form and the story takes the form of SliceOfLife comics. Although clichés are unavoidable, Millennials offers a bittersweet, 'Laughing on the Outside, Crying on the Inside' kind of feeling that is suitable for all generations. LazyBum: as "everybody" knows, millennials are lazy. And they love to tell themselves they are. The fact that they aren't ashamed of it makes them also lovable and relatable. Generation Xers where also lazy, it's just that they couldn't say it at loud. BrilliantButLazy: sometimes it's not even about lazyness; life it's just easier thanks to technology, why all the fuzz? TheGenerationGap: Generation Y vs. Generation X is always a panel away and it's an endless comedy material source. TheDitz: the millennial Ditz usually is a selfie girl or a Youtube star running a beauty channel. SelfDeprecation: self deprecation it's the easiest way to make the audience laugh without taking any risk. When a stand up comedian or the avatar of a comic artist have fun of him/herself through self-deprecation the audience can choose if identifying with the sketch (this is when the 'relatable' happens) or take the distance and laugh at something different. Contemporary gag a day comics (done by millennials and read by millennials) often use this Trope to avoid the greatest danger of all: a conflict in the comment section. Geek: an ultra-connected generation sourrounded by technology calls for it. Video games, comics, superhero movies and such are just a few of the cultural references that the millennials aren't afraid to claim as their own. RidiculousProcrastinator: the official sport of gen.Y. It looks like young people made a decision that procrastinating is something you should be proud of. How to achieve this? By practicing and laughing about it, like in this exemple  '' where the protagonist is hunted by two imaginary friends reminding her it's time to complete at least a task. Selfie: what would it be a comic about millennials without a selfie or two (or two millions)? IdenticalPanelGag: like the cover picture of this page. BeatPanel: silence is your friend when an awkward situation comes up. Like in this exemple  '' where the main character is giving a speech and her audience is giving her hell on Twitter, but refuse to do it on her face. LifeEmbellished: life in a slice of life comic is never funny enough. So sometimes the author adds some extremely unlikely to happen events, like in the episode where Kim Jong Un is hit on his face by a hard avocado, dies and get replaced by the avocado itself as a new leader of north Korea. AuthorAvatar: when a comics author loves comics more than everything else he/her cannot resist to the tempation to make an appearence. Or two. Or basically being in the comics all the time. This is also the case of Millennias' auhtor and her unwilling to be there boyfriend, called simply 'bf'.